Fatigue, weight gain, forgetfulness, mood swings… is it still winter? Or are these symptoms an indication of hypothyroidism? While you might struggle with the winter season to maintain energy and sanity, these persistent symptoms are a few of the signs related to low thyroid function, also known as hypothyroidism. More commonly found in women, approximately 5% of Americans have hypothyroidism, which occurs when the thyroid gland is unable to produce enough thyroid hormone to support several metabolic functions in the body. The thyroid gland secretes two main hormones, thyroxine (T4) and triiodothyronine (T3). T4 is the hormone that is principally produced by the thyroid gland which is then converted in the liver and kidney to the metabolically active T3 hormone. It is the T3 that is responsible for regulation of metabolism, energy production, body temperature, body fat, cholesterol, cognitive function, and symptom improvement. Optimizing thyroid function by replacing thyroid hormones to optimal (upper range of normal) can significantly increase energy, metabolism, and well being. Many studies (NEJM, New England Journal of Medicine & JCEM, The Journal of Endocrinology and Metabolism) demonstrate that raising Free T3 levels in addition to T4 levels is essential to obtaining these results. Traditionally physicians have prescribed thyroid hormone in a form of T4 only, also known as Synthroid®, Levoxyl®, or L-thyroxine. Recent studies, however, have demonstrated that this may not be sufficient in many patients to truly feel well. This might not be accomplished, as per recent medical literature, until these patients have improved or optimized T3 replacement, as it is the T3 at the cell level that is responsible for thyroid function, and not T4. Nevertheless, it is usually only the T4 preparations that physicians are taught to use for thyroid replacement. Unfortunately, using primarily a T4 only preparation typically does not allow for adequate conversion to T3 and therefore improvement in symptoms is often not adequate. Whatever the cause for the inadequate conversion of T4 to T3, many patients have persistent low thyroid symptoms despite adequate T4 replacement. 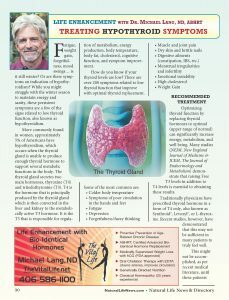 For the conclusion of this article visit Dr. Michael Lang’s website, TheVitalLife.net. Go to Services and then the thyroid section. Call Dr. Lang, ND, ABHRT, for an appointment at (406) 586-1100. 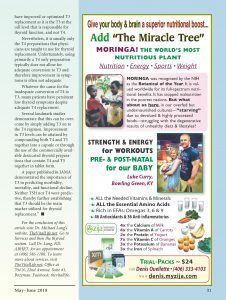 To learn more about services, visit TheVitalLife.net. Office at 704 N. 22nd Avenue, Suite #1, Bozeman. Facebook: thevitallife.